Again, the feeling. It’s really moments like this that make me hop on a plane and travel 10000 kilometers out East. 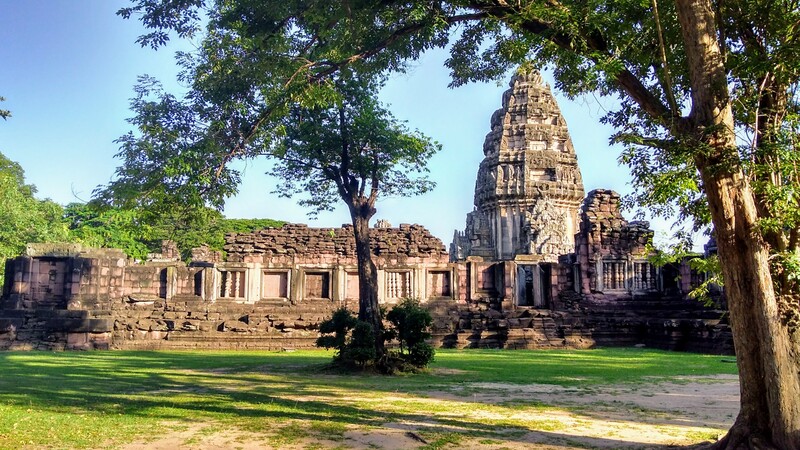 And, no, it’s not the history of the Phimai ruins -I’m afraid I’ve been a bit too lazy to read up on the Khmer civilization-; or the sheer beauty of the place on a quiet weekday afternoon. It’s not even the promise of delicious Pad-mee-Phimai pet nit noi (make it spicy, but not too much!) waiting for me at a cooked-food stall just outside the historical park. A fitting reward for my cultural merit-making. I feel blessed as I attempt meditation in the shade of ruins almost a thousand years old. I relish in the sight of the Khmer buildings blending in with the trees, all bathed in the golden late afternoon light. It strikes me how intense the colors get – green, ochre and blue. And how quiet and serene it feels when compared to the hustle and bustle of the smallest of Thai towns, with its markets, motorbikes and pollution. Soon enough I quit any attempt at Vipassana and giggle as I discover the warning sign: The stone falls. Now I’m finally meditating, albeit light-heartedly, on the sign before me, and its use of the present simple tense. A language teacher at heart, I remember my Michael Swan. “We use the present simple to talk about permanent situations, or things that happen regularly, repeatedly or all the time”. “Is this a literal translation of Thai?” I wonder. If so, how fatalistic can Thais be? And how ironic, considering how little these stones have actually fallen! I bring out my mobile, mentally exploring the range of witty updates I could post on my social media. Later, I decide. Let this be a private party. For it is neither the history, the beauty, or the promise of food and big smiles awaiting outside the historical park. Nothing in itself – it’s the combination, as always is for me in Thailand. The beautiful and the bizarre, intertwined, when you least expect them and tasting of som tam, sticky rice and Chang. So sure as the stone falls I’ll keep coming back for more.